Last year I wrote that you could make life-changing friendships with animals at Jungle Island (5 stars PLUS), which had newly reopened after a hurricane. This year, they feature a dozen new animal interactions and their new SuperFlight, which are unique in America. and at a few places in the United States and Canada. But there’s nothing like meeting animals at Jungle Island. 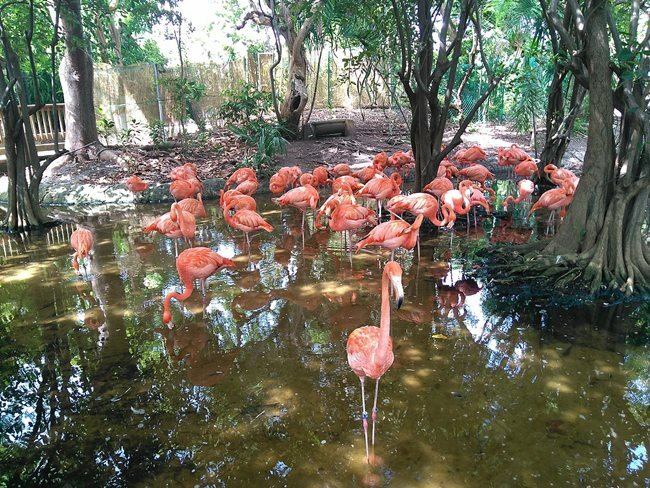 Take the complete VIP tour or one of the partial tours, and a staff member will personally introduce you to and explain the lives of some of the dozens of animals available for encounters. With these intimate, close-up visits, you can pet, feed, and sometimes hug or get peed on. 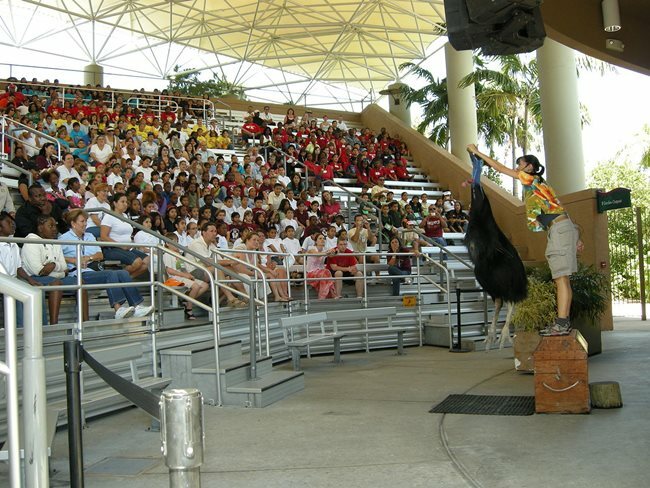 The encounters at Jungle Island don’t feel choreographed; animals aren’t trained to sit up and shake your hand. Of course you can take photos, but it doesn’t feel like a staged photo opp. Instead you sit a moment, briefly inhabiting each animal’s world, as part of each animal’s natural day. 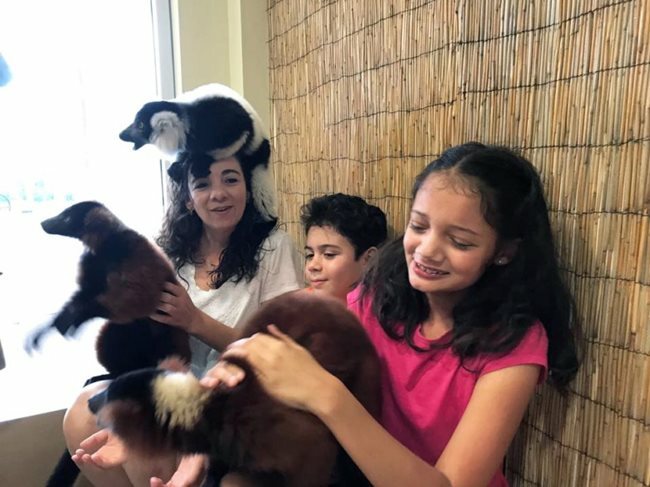 Meeting the lemurs, for example, our favorite, you get a sense of what it might feel like to grow up with primates in every room of your house as part of your family. That in fact was the experience of Ryan Jacobs, the executive in charge of tours. Ryan grew up with orangutans roaming his childhood home, and his mother, Linda Jacobs, is Jungle Island’s director of primates now. Last year at Jungle Island, we petted a giant condor, ancient tortoises, fed a giant alligator by a long pole, and saw up close a cassowary, the most dangerous bird on Earth and the closest living descendant of the velociraptor made famous by Jurassic Park. This year, our amazement was like coming to Jungle Island for the first time. Thanks to several new items, and Ryan’s enthusiastic and entertaining stories, we learned even about the animals that we passed by quickly in-between encounters. At a zoo, having a parrot sit on your shoulder for photos could be the centerpiece attraction. At Jungle Island, that is just the beginning. You will have unique experiences that you can’t get anywhere else. We fed a baby capuchin monkey, draped a Burmese python around our neck, and petted a Eurasian owl, a honeybear, baby goats, kangaroos, flamingos, and more. 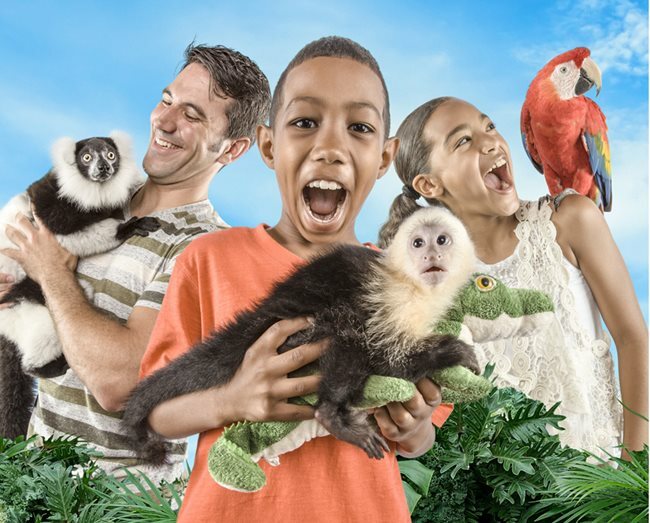 There’s just so much to do and see at Jungle Island. You will get fantastic photos, but more importantly you’ll learn something about yourself. You’ll quickly get over your fear and find surprising comfort in interacting with the animals. Getting a sense for how animals react to you and how they behave reminds you that you, like all humans, are part of nature. Short of working at a zoo, Jungle Island is the closest you will ever come to befriending dozens of exotic animals, anywhere in the world that I have been so far. They’re so cute! So friendly! And we’re not even halfway through what Jungle Island has to offer. The Cafe’s one-page menu offers sandwiches, salads, pizzas, and desserts, but they are anything but ordinary. The food took longer than it should have to arrive. My partner’s Flamingo Bowl came first. She offered me a taste, and I found that I couldn’t stop taking more and more “tastes”! Then, my Bacon Cheeezzz Burger & Fries came, and it was so good that I secretly didn’t want to share it. The Flamingo Bowl is chicken (or your choice of steak or shrimp) atop rice and black beans. Wow! Just the rice pilaf and black beans were uplifiting and wholesome. Those are top quality ingredients. The chicken is delicious, not overcooked or over-sauced, but just hearty. The juicy meat makes you feel invigorated, like you’re not eating park crap but giving yourself genuine nourishment. My Bacon Cheeezzz Burger & Fries were also so, so tasty. The burger does not need condiments at all. It’s got multiple layers of meaty taste, not too greasy, and served piping hot. The fries were piping hot, a generous portion of shoestring fries that didn’t seem oily. Thankfully, the bun was thick, a kind of Hawaiian roll bun, and the hamburger’s layers sat well, instead of being so sauced up that it falls apart in your hand. And the bacon isn’t hard, but rather comes apart with each bite as though part of the seasoning. We also tried the Gregory’s Baby Got Back Ribs, a half rack of pork ribs, which were good but not outstanding. The BBQ sauce was good and the ribs had a hearty kick of protein, without being too sweet or oily. We recommend you get the Hubert’s lemonade, which is not sicky-sweet, but rather just interesting, with depth to it. It certainly takes like it’s made with real lemons. Also notable on the menu is the Let’s Wrap It Up, which is a wrap of chicken salad with dried cranberries, and the Nicoise Salad with tuna and boiled eggs. The park also features a Concrete Beach Brewery beer trailer. Elsewhere at the park, you can find two Escape Rooms. These are 20-minute attractions fitted onto trailers. Inside you’ll find imaginative displays with faux wood paneling, a desk, some books, and thankfully air conditioning. They lock you in and then you solve puzzles and clues to escape. For example, you might get a hint about Columbus and then discover that 1492 is the combination code for a lock that opens a filing cabinet, where your next clue is a Chinese puzzle box containing the key to opening the main door. The attraction is interesting, but has only basic set design and production quality. And newly opened is their SuperFlight. It’s a skydiving attraction where you never leave the ground. Instead, giant fans underneath you blow air upwards, and you can “skydive” on that column of rushing air. We’ve reviewed indoor skydives such as iFly in Orlando, The Niagara Freefall & Interactive Center in Canada, and Skyventure in New Hampshire, where you fly inside a giant indoor room, a cylindrical room with clear plastic walls for visitors to see you through. 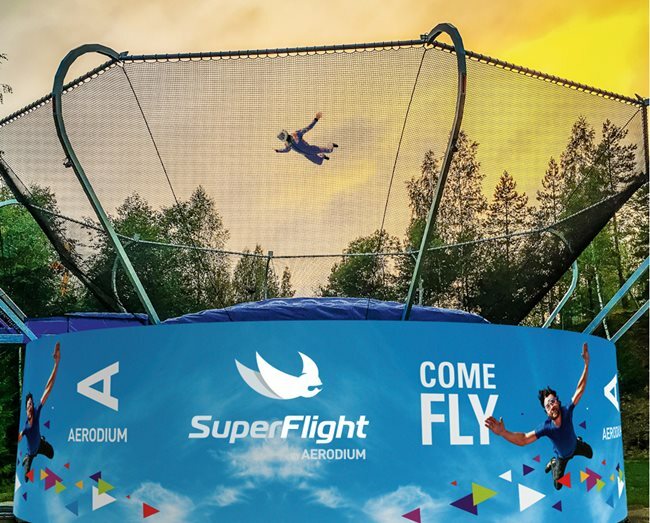 SuperFlight takes the concept to the next level, because their attraction is outdoors and has no walls. Instead you “fly” outdoors, surrounded by netting, open to the environment. The basic experience is 40 minutes of preparation. You watch a video, get a safety instruction, put on a flight suit, and then get 2 minutes of flight time. Of course you can buy packages with longer flight times, but 2 minutes is plenty for your first experience. Wow! They really have streamlined the training. It’s so clear and simple to learn what to do, and a few hand signals, since it’s too loud for conversation in the wind tunnel. Although theoretically being outdoors lets you enjoy a view, in practice you’ll be a little busy with 60 mph of wind smooshing your face and entire body. And the instructor will face you towards whomever is taking your photo rather than towards the vista of Miami. However, being outdoors is definitely the best way to skydive, including actual airplane skydiving, which I have done. It’s easier, safer, costs less, and is the same experience as falling from a plane, without the terror of falling from a plane and discomfort of the parachute harness (where your entire body dangles from the chute by your crotch straps). Some people might argue that terror is part of the fun, but those people should seek help. Go to SuperFlight for your skydiving needs. It is the only outdoor skydive attraction in the United States at the moment (with a second one coming soon to Missouri). One note: perhaps their next net could be white mesh, or transparent fiber, for better photo-taking. SuperFlight seemed safer and roomier than the indoor tunnels we’ve tried before, and was so easy to do. Our instructor did not make us feel that we needed to be macho at all. Pro tip: you will want to visit your hotel to wash up and change clothing after handling animals, so wear the flight suit first when you are fresh. There’s so much more to do or coming soon at Jungle Island. Their website needs a serious upgrade with photographs and dedicated description pages for each part of their attraction, but from what I can gather is this. Jungle Island is also building Miami’s first zipline, a 600-foot course through the “jungle” of the park. They are also building a ropes course and a water park. They have animal shows, field trips, an adventure camp, sleepovers, and of course you can get married or hold your corporate event on site. They also have a calendar of events, including food tastings and for Valentine’s Day you can take a VIP tour to learn about how animals also fall in love. Our tour guide, Ryan Jacobs, was such the perfect host that he achieved the impossible — something I have never felt on a tour before in 13 years. I felt so comfortable with the animals and at home that I forgot — I do not live at Jungle Island! I have an entire rest of my vacation to get on to! It completely escaped my mind, so captivating was our experience there. You expect your second visit to an attraction to be lackluster, but we were even more amazed and fell even more in love with Jungle Island our second time. On our way to the US Virgin Islands we made a special stop in Miami and you should too. I’m glad to again give Jungle Island my rare five stars PLUS, making it a must-see and to us the #1 attraction in Miami. Here’s some video of our showing the Events INSIDER website to some of the friendly animals at Jungle Island.